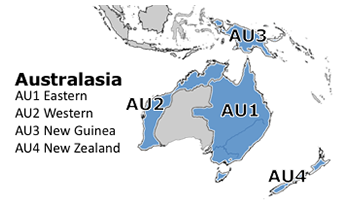 We divide the Australasian Region into four subregions that largely correspond to areas of freshwater mussel endemism. The Eastern Subregion (AU1; 5 genera, 14 spp.) includes much of the eastern half of Australia (including Tasmania); the Western Subregion (AU2; 3 genera, 6 spp.) is the western half of that continent. New Guinea (AU3; 7 genera, 11 spp.) has a somewhat diverse freshwater mussel fauna (especially considering the amount of suitable habitat), but that assemblage is poorly understood. The subregion includes Misool and the Solomons islands. Finally, there is New Zealand (AU4; 3 species in 1 genus).